I grew up in the orbits of close family members with narcissistic personality disorder (NPD) and developed abnormal views and expectations about relationships. I knew something was wrong, but could not figure out for decades what that thing was. I've sought counseling to figure out what was wrong with me or with my family members. The ethics of Christ, including his emphasis on forgiveness and forbearance, probably hindered my quest and my counselors input. But as serendipity would have it, while killing time in the local library, the cover story of a recent Psychology Today was about spotting a narcissist. I had explored the topic a bit before this article and had found information on this topic, but I still had not been empowered as a victim of narcissists. Narcissism is everywhere, and all of us have narcissistic tendencies, but I learned that someone who has NPD has no ability to distinguish between their selves and others. To someone with NPD, everyone around them is an extension of them. It's very weird, and can be emotionally, psychologically, and spiritually destructive to their children, co-workers, employees, and lovers. 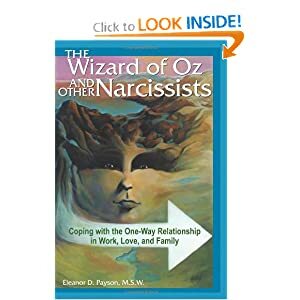 One psychological website recommended a few books, one of which I bought, The Wizard of Oz and Other Narcissists: Coping with the One-Way Relationship in Work, Love, and Family after looking at half a dozen and comparing the reviews on Amazon. As soon as I started the book, I was ready to start underlining, but after the first couple pages, I realized everything was worth highlighting, and I put the pen away. The reality is everyone is broken, but some are more broken than others. Eleanor Payson didn't bother with trying to explain how this disorder might arise, but focuses on how the disorder affects different relationships and how to assert your distinct self. An early illustration in the book that was very helpful for me is the NPD person might view me as an arm, and if I disturb his order of the world, then I am perceived like an itch on his arm, something he might scratch or brush off. As far as he is concerned, the assertion of my rights, is a discomfort that needs to be swatted, like a mosquito. However, I need to stop seeing myself as a mosquito, as I was raised to believe, but as an equal human being fully entitled to my feelings and fully entitled to reject abuse. Of course this will lead to more conflict. Payson provides examples and guidance in how to assert yourself in different relationships: to parents, to lovers, to supervisors and co-workers. It really doesn't matter if your convenience store clerk is a narcissist because you can buy milk from him and leave the building, for a total of 5 minutes of interaction per week. But these other relationships involve power, time and emotion. This book has plenty of anecdotes from her counseling experience yet remains concise and quick to read. If you are involved in any sort of dysfunctional relationship, I recommend this book as a short introduction to this topic. 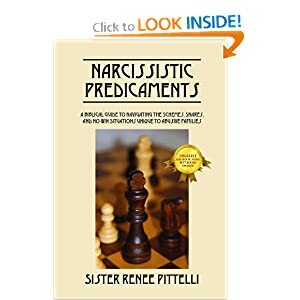 I also bought a second book by a Christian woman, Sister Renee Pittelli, called Narcissitic Predicaments. She does not write from professional training, but from her own terrible experiences from her childhood and as someone who started a ministry for those traumatized by these kind of relationships. I cannot recommend this book though. Although she has found healing and recovery in her own life, the bitterness with which she writes, although rightly earned in light of the suffering her family put her through from early childhood through her late 40's, stains her writing. Although the NPD person causes great pain and suffering, they are not necessarily choosing to do that, they are barely able to empathize with others, since they barely comprehend the concept of "other." Without this professional perspective, Pittelli only has one understanding of them, evil. Although I can empathize with her, I believe she ends up dehumanizing the offenders, not too much unlike the offenders can't humanize those around them. She likes to use many verses, sometimes out of context, to justify some behaviors that seem contrary to Christ's ethics. She believes that one should only forgive those who apologize. This is not an uncommon belief, even among Christians, but I agree with the aphorism that unforgiveness typically results in bitterness. Bitterness, a wise friend tells me, is like drinking deadly poison and hoping someone else dies. Previously on this blog, I wrote about the Lord's prayer and concluded that forgiveness is the relinquishing of my rightful claim to justice. I develop that some more here but Jon Acuff has an amazing anecdote about forgiveness in a Viet Cong POW camp. The bad taste of bitterness that flows between the lines of Pittelli's writing was emotionally draining for me as I read the book. Sometimes, I needed to put it down for a day or two, so that I could find my spiritual equilibrium again. I didn't want to retain her bitterness. I don't believe she thinks she is bitter, and towards the end of her book, it diminishes, but her commitment to unforgiveness until repentance leaves her no other emotional option. This book could serve as a warning to Christians who are tempted to choose unforgiveness. I can, however, recommend the last chapter to everyone who is beginning to escape from the NPD person. I also can recommend the middle of the book where she gives 102 questions to analyze a relationship. At the end of the book she shares 6 lessons we will learn when we start making boundaries and treating ourselves as the individuals we are: 1) they will lose their ability to affect us emotionally, 2) they are not normal and never were, 3) they may never change but we will, 4) there are safe people out there who aren't out to hurt us, 5) we will recognize abnormal sooner and protect ourselves, 6) healing takes time, including moving through the stages of grief. I am only beginning to learn these lessons. I finally do have boundaries to prevent emotional damage. I'm learning that not every family is as whacked as mine. Jesus saves but does not always heal others. I'm learning to not be ashamed of what I went through. It isn't my fault and I don't need to defend those who hurt me. I've always recognized abnormal but never fled it, but got stuck to it like a tar baby. I'm looking forward to more healing. Healing from the damage of being in a relationship with someone who has NPD involves letting go of the impossible responsibility to achieve normalcy in such a relationship. The first book reviewed here, The Wizard of Oz and Other Narcissists, can help those of us who are damaged. I highly recommend it. One side effect of the book is that you start diagnosing every jerk around you as a narcissist, and most national politicians. That's not fair or true, but it sounds more refined than "jerks." I can understand your sentiments here. For the past couple of years, my wife and I have been dealing with the fallout with her family. It's a long story, but suffice it to say that through counseling, while we can't officially diagnose him as such, her father shows strong tendancies of narcisism, along with other unfavorable characteristics present in both him and my wife's mother and brother. It has been a long, slow journey to healing, and my wife still has days of deep hurt. We have had to drastically limited their input in our lives recently. My wife has told me that she must forgive them every day, although some days it is more difficult than others. She does it though to keep herself from becoming bitter, as you pointed out is certainly important. We pray often that there will come a time when a restoration of the relationship can occur, and we believe that with God, any and all is possible, so we continue praying. As an aside, I don't know if you took a look at this book or not, but it was one that my wife found insightful. It is called "Boundaries" by Drs. Henry Cloud and John Townsend. You have my full empathy Joe. I liked the first book more than books and counsel like Boundaries because it helps me to learn "why" I'm making boundaries.